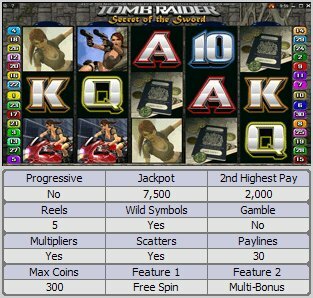 Overview: One of the most ambitious video slots yet seen in online gambling: Tomb Raider - The Secret of the Sword is presented in a glossy 5 reel 30 pay-line multi-faceted package that sets new standards in every aspect of gaming, this outstanding game offers hours of interactive entertainment and the chance to hit major rewards through a variety of free spins, bonuses, wild and scatter awards and free games. Secret of the Sword is by far one of the most ambitious games ever created, and allows for a level of interactivity never experienced in any game before. With almost photo-realistic graphics and a gutsy list of features; the game offers suspense and exhilaration accompanied by all the twists and turns one would expect from this title. Similar Slots: If you like Tomb Raider - Secret of the Sword, you might like these other 5-reel slot machines: Avalon, Cabin Fever, Dance of the Masai, Days of the Tsar, Dolphin Tale, Thunderstruck II.